Ricoh pursues products and services that simplify your life and work based on an understanding of social issues and taking diversity into account. As information equipment becomes more sophisticated and multifunctional, it has become very important to help customers use and understand the built-in functions. The Ricoh Group is committed to taking responsibility for its products and services in a way that will build a society where as many people as possible can enjoy fulfilling work and a comfortable living environment through the benefits of information technology. 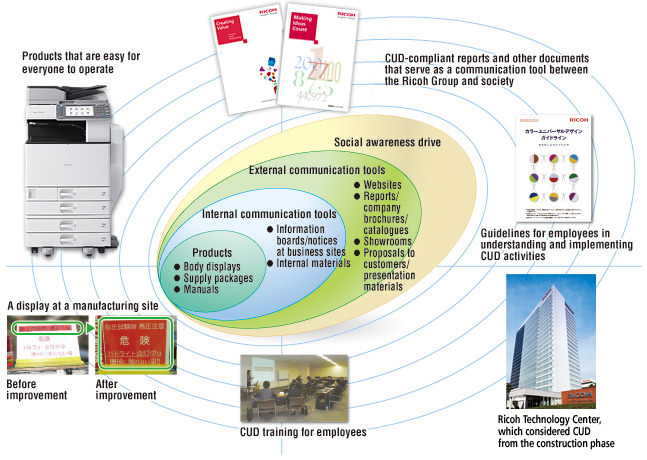 One of our efforts to achieve this goal is the development of products and services in line with one of RICOH Brand Benefits:"Simplify your life and work," which emphasizes human-friendliness. Ricoh's products are already uniquely qualified to simplify your life and work. Now we're taking things even further. 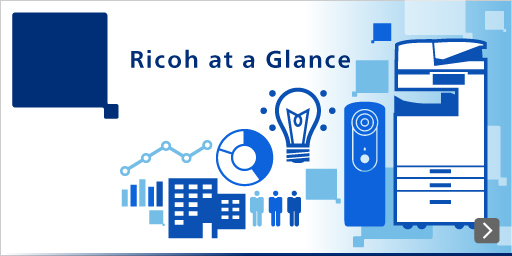 Ricoh's products and services, including multifunctional digital copiers, are always being improved and are used by more and more people. Some users, however, are not familiar with how to use them or how to remove jammed paper from copiers, which sometimes inconveniences them. Much of today's sophisticated, increasingly multifunctional technology can only be mastered by users who are highly IT literate. That's why Ricoh is focusing more than ever on accessibility. We want more people—with or without disabilities, young and old—to benefit from the intuitive operability and convenience of our products. We're giving our products more functions. Functions that more people can easily operate. Going beyond delivering the high level of functionality and reliability that satisfies our customers, Ricoh determined to go the extra mile in user-friendliness as well. Our efforts have produced thoughtful, high-performance accessibility enhancements designed to simplify your life and work. For example, to enhance user interaction with Ricoh devices, we've implemented easy-to-read large 8.5-inch, full-color LCD panels. 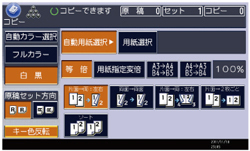 Also a simplified display settings are implemented for older people and others with less-than-perfect eyesight. And on the rare occasions when it may be required, guidance on clearing paper jams and other troubleshooting is provided with easy-tounderstand animated icons. We're innovating to save customers time and effort in other ways too, with bottle-shaped toner cartridges, designed to be replaceable with one hand, and a detachable scanner unit that can be comfortably operated even by wheelchair-users. Intent on delivering advanced userfriendliness, Ricoh looks at things from the perspective of the customer, not the manufacturer. Our manufacturing processes are customer-driven: we study how customers actually use our products, and reflect our findings in ongoing research and development. For example, we perform, repeated tests to determine the exact strength needed to pull a paperfeed tray out smoothly, and to ensure that our devices can be operated by people with various physical disabilities. To verify the accessibility of our products, we distribute questionnaires to users. These efforts all help us to improve our products. More efforts will be focused on pursuing the more challenging goal of providing customers with products and services that simplify their life and work. Ricoh is promoting "colorization" of office documents ahead of other companies in the industry. The focus of our business is on introducing multifunctional color copiers and color printers to the market so that people can enjoy all the benefits and make good use of the effects of colors in conveying information in a variety of ways. However, it is also true that many people with imperfect color vision face obstacles with increased colorization. In this context, we promote of color universal design (CUD), which is exactly in line with our efforts to promote the colorization of information. Continuing efforts will be dedicated to building a society where as many people as possible can enjoy the benefits of colorization.